No crafter should feel limited by the yarn colours available in a favourite fibre shop not when it's so fun and satisfying to hand-dye yarn and fleece right in the kitchen. Ultimate color control is now within the reach of anyone who loves yarn and fleece. 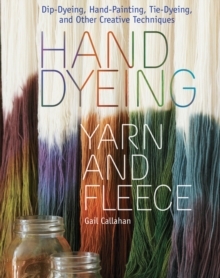 In "Hand Dyeing Yarn And Fleece", self-taught dyer Gail Callahan uses fibre, colour, and heat to create exciting new yarns and yarn colours. Her recipe style instructions lead readers through a variety of simple techniques that turn plain or outdated yarns into colorful fibers, customized by colours and quantity for the project at hand. And there are even eight projects for knitters eager to use their new yarns. Standard kitchen equipment is all that's needed to set up a kitchen dye shop. Dyeing can be done in a microwave oven, a sturdy stovetop kettle, a crackpot, a traditional oven, or even an electric frying pan - Callahan covers every method. Dyeing doesn't end with the simpler single-colour methods. Adventurous crafters will find instructions for designing self-striping and multicolored yarns with dip-dyeing, tie-dyeing, hand-painting, and other inventive techniques. Detailed advice on colour theory and types of dyes, including food colours and other 'grocery store' dyes, make the entire process achievable for complete beginners.